My BEST Tips + Tricks For Getting Out ALL. THE. STAINS. X Molly’s Suds! THIS POST IS SPONSORED BY MOLLY’S SUDS. PRODUCT + COMPENSATION WERE RECEIVED. ALL OPINIONS ARE MY OWN. In all seriousness laundry and kids go hand in hand and as busy, modern Moms, it is VITAL for us to be armed and ready with the right products to ensure our family’s clothes are getting clean, stains are being removed, and the products we choose to use are safe for both our babies and the planet. Since having Brody, I am more aware now than ever on what is going on his body (and mine)! Speaking of, did you know that what we put on our skin actually gets absorbed into our body? This is why I am so passionate about Molly’s Suds and their commitment to creating healthy and safe laundry products! I can honestly (and confidently) wash Brody’s clothes, crib sheets, family towels, washcloths, and bibs without having to worry about harsh, toxic chemicals and skin irritation. 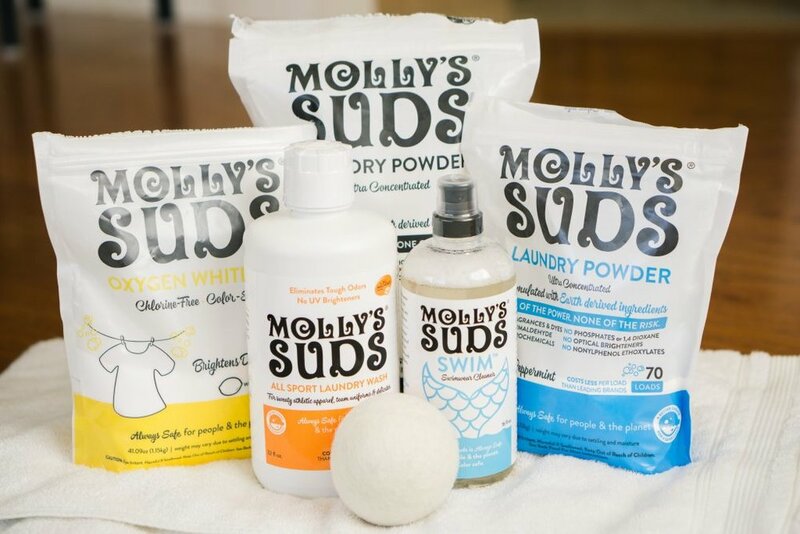 If you’re a Momma, Molly’s Suds needs to be in your laundry room arsenal, STAT! Today I will be sharing some of my top tips and tricks for getting out ALL the stains because y’all… stains are a real thing at the Blossom house! Whether it’s another diaper explosion or a bib full of spaghetti, stains are inevitable for us Mommas and as a new Mom myself, I’ve had to learn quickly what products actually WORK to get rid of stains in a safe and effective way! Grab a pen and a cute little sticky note, Momma! You’re going to want to write these tips down! Whether you’ve got littles at home like me or you’ve got sweaty (and stinky! ) high school athletes, these stain fighting tips are an absolute MUST for your laundry room agenda! For Diaper Blowouts: Yup. Those stinky, up-the-back blowouts… they mean serious business! After the blowout, immediately spray off the chunks in the sink (sorry… gross, but let’s just be real… #momlife) and soak in cold water with 1 cap of Molly’s Suds All Sport and brush area with a soft toothbrush. Let soak for 20 minutes, then wash on a regular cycle with cold water and another cap full of Molly’s Suds liquid laundry detergent. For Swim Gear: Every Monday I take Brody to the pool to teach him how to swim and be comfortable in the water. In addition, every Wednesday and Friday, I am in the pool for long eight hour days for Aquatic Therapy. It is safe to say that we are a water family! So, after all of our pool days, I soak our gear with Molly’s Suds SWIM to help keep our suits fresh and to enhance the lifespan! For Stinky Workout Gear: You girls know that we are an active family! I love to run and Brian loves to play basketball. So, it’s of no surprise that our workout gear piles up throughout the week! To wash our sweaty and smelly gear, I will throw one load of JUST workout gear into a bucket or into our washer with one cap full of Molly’s Suds All Sport and I will let our workout gear soak for 30 minutes. Next, I’ll rinse and drain, then complete a full laundry cycle with 2 scoops of Peppermint Laundry Powder (this is my favorite!!)! Keep Bath Towels FRESH: We’ve ALL been there… that yucky mildew smell from towels is truly a force to be reckoned with! If you just virtually gave me a high-five and are sprinting to your bathroom cabinets to pull out those stinky towels, get it girl. Here’s what you need to do: Add 1 cup white vinegar to your washer machine, set your water level to high and warm, then place towels in. Wash for a full load without any soap. After the cycle is done, if you still smell mildew, wash again, this time with 1/2-1 cup of baking soda (without detergent). After this wash, your smell should be gone! Throw your newly fresh towels into the dryer with Molly’s Suds Dryer Balls (I love to add a few drops of lavender essential oil onto the balls for extra freshness!). VIOLA! Good as new! Keep whites, WHITE! Lastly, your whites! Okay, Mommas. This one is my absolute FAVORITE!! Raise your hand if you have whites that actually look like cream or even a tad bit dingy… if this is you, HOORAY for a solution! Molly’s Suds Oxygen Whitener is EVERYTHING! I actually let my whites soak with a heaping scoop of this detergent in cold water for a good 20-30 minutes, then will continue on with the wash cycle. This whitener has been SO helpful for Brody’s white onesies I soak them at least once a week, twice if we’re having a big blow out week haha! I hope these tips were helpful for you!! Please know that YOUR laundry routine does not have to be a burden! When you learn the tips and tricks for overhauling stains and keeping your family’s clothes fresh and free from toxic ingredients, you truly will WIN with the laundry (don’t forget the one load of day rule that is a staple here at BMAB! ). Love you, Mommas! Happy Stain fighting! Be sure to use code Blossom25 for 25% off your Molly’s Suds order today!